This volume gets off to a flying start with "Hypnotwist," Gilbert's epic story of a beautiful, leggy redhead's surreal journey into a night filled with mysterious shady characters, dreamlike violence, and sparkling retro spike heels. Then, in the concluding 50-page chapter of Jaime's outrageous, acclaimed, superhero mash-up "Ti-Girls Adventures," our protagonist, rookie do-gooder Boot Angel, learns more hard lessons about becoming a superheroine. Eventually, just about the entire cast gets together for a reunion that unexpectedly takes place in Maggie's tiny bedroom apartment. Finally, Beto gets top heavy with "Sad Girl," and introduces Killer! the sweetest teen starlet of the solar system! 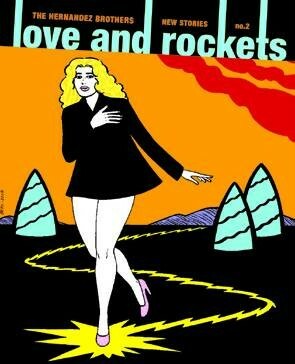 Forget WATCHMEN, LOVE AND ROCKETS is the big one!